Your support allows our hospitals’ equipment to be purchased more quickly, and ensures our healthcare teams stay on the leading-edge of technology and treatment to provide the best possible patient care. 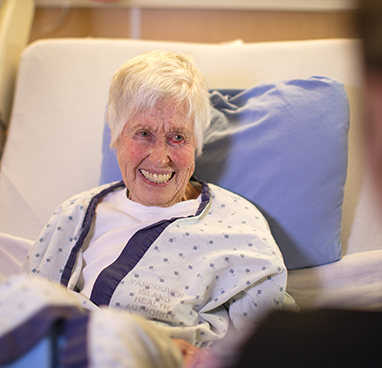 The generosity of our donors has a significant impact on patients in our hospitals. Together, you fund 40% of the equipment in our hospitals. This showcases your commitment to leading-edge care on Vancouver Island, your support of the brilliant work our care teams provide and your investment in their talents to help attract and retain the best and brightest. In 2017/18, your support allowed us to raise over $12 million to fund 114 urgently needed pieces of equipment across all 11 areas of care in our hospitals. These advanced tools will help our hospitals transform the lives of local patients for years to come. Thank you. We are stronger together and giving makes us all better. We are proud to say, funds raised in this community stay in this community. Your giving allows our hospitals’ medical teams to have the tools they need to do their best work. Because of you, they can provide the best possible patient care. Every year, the Victoria Hospitals Foundation works with Island Health to determine the most urgent equipment, special projects, education and research needs to provide support for all medical specialties at Royal Jubilee, Victoria General and Gorge Road hospitals. 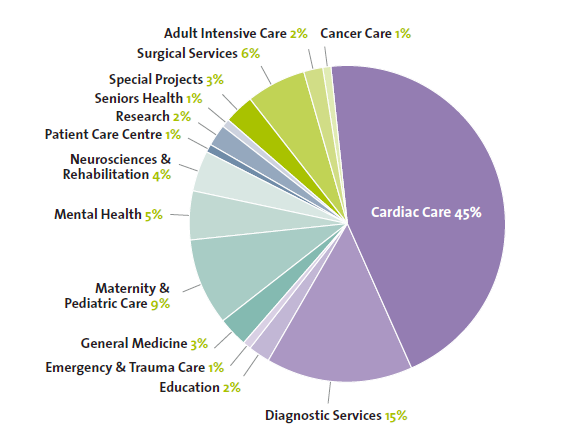 In 2017/18, your gifts funded equipment in every area of care: diagnostic services, cardiac care, emergency & trauma care, adult intensive care, general medicine, maternity & pediatric care, neurosciences & rehabilitation, mental health, seniors health, and other important projects. The diagram below illustrates how impactful your gifts are in our hospitals and where they were directed to in 2017/18. There are more than 6,500 staff and physicians at Royal Jubilee and Victoria General hospitals. Their experience, training and teamwork enable them to make quick, informed decisions, but they need the latest equipment to do their best work and perform advanced procedures. Much like any technology, hospital equipment changes quickly. Ensuring our caregivers have tools of the highest quality means our Vancouver Island patients can continue to receive excellent care. 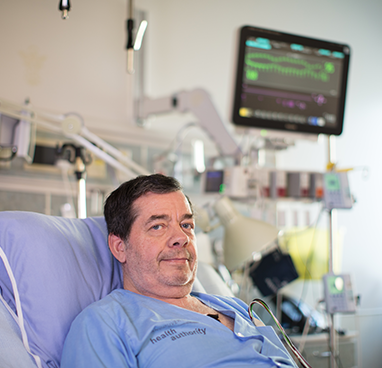 Your generosity lets us purchase equipment sooner and more often, ensuring leading-edge care for patients across Vancouver Island. Note: In 2017/18, cardiac care was the focus of our major campaign, but every area of care benefitted from the generosity of donors throughout the year. To learn about other past campaigns, please visit our recent successes page. The 114 new pieces of equipment funded this past year will enhance patient care in our hospitals for years to come. With your help, we ensure every corner of Royal Jubilee, Victoria General and Gorge Road hospitals advance their standard of care in every area. Our donors play a meaningful role in ensuring our talented care teams have the tools they need to do their best work. Thank you for your support. We take our role as stewards of your generosity seriously. Committed to keeping our fundraising costs low, we aim to spend the highest percentage of every donation on leading-edge equipment that directly benefits our patients. The Foundation’s average cost of fundraising of 16% falls well below Canada Revenue Agency’s guidance to remain under 35%. 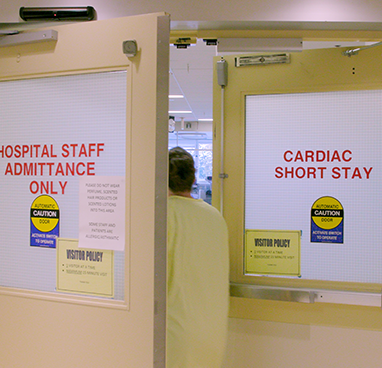 Every year, we work with Island Health to determine priority equipment needs in our hospitals. From their list of priorities, we identify two main fundraising campaigns that reach the community in a variety of ways. The You Are Vital campaign aims to raise $3.5 million for 100+ pieces of equipment that will benefit all patients, from newborns to seniors, across all 11 areas of care at Royal Jubilee and Victoria General hospitals. This advanced equipment, which includes an improved patient monitoring system across both hospitals, provides critical information that directs care, so caregivers can pivot their assessment and treatment with immediate, vital information. To learn more about the campaign, visit our You Are Vital campaign page. Find below examples of past campaigns. For a more comprehensive list, please visit our recent successes page. In the spring of 2018, we raised $500,000 to fund seven new point-of-care ultrasound for seven specialized areas of Royal Jubilee and Victoria General hospitals. The Beneath the Surface campaign highlighted the 100 ultrasounds performed at the hospitals every day. Your donations will allow our clinicians to go beneath the surface and see what is happening inside a patient’s body for years to come. In the fall of 2017, we raised $3.2 million to fund 34 new pieces of advanced equipment in seven different areas of cardiac care through our In a Heartbeat: Everyday Miracles campaign. With more than 6,300 cardiac procedures performed annually, this campaign had a genuine, enduring impact. Your donations allowed us to equip our world renowned Heart Health team with the tools it needs to ensure patients have the best outcomes possible. In the spring of 2017, we raised $405,000 through our Redefining Possible campaign. Your gifts helped fund 23 new pieces of leading-edge neurology and rehabilitation equipment. For patients who have experienced a stroke, live with chronic pain, or suffer with MS or epilepsy, this equipment makes a world of difference through improved assessment, treatment, and quality of life. In the fall of 2016, we raised $1.8 million to fund 72 pieces of surgical equipment for Victoria General and Royal Jubilee hospitals, across 14 surgical specialties, including cardiac surgery, orthopedic surgery, eye surgery and neurosurgery. This equipment allows surgeons to perform leading-edge procedures, not previously possible, so most patients can now stay close to their loved ones. Today, 98% of all surgeries can be done here on Vancouver Island. About 52,000 surgeries are performed at Royal Jubilee and Victoria General hospitals every year. Launched in 2011 and completed in March 2014, Building Care Together was the most ambitious campaign in our Foundation’s history. We raised $25 million to equip the newly constructed Patient Care Centre at Royal Jubilee Hospital with state-of-the-art equipment so our medical teams can provide the best healthcare possible to patients across Vancouver Island. The long list of equipment funded by our donors included Smart Beds, vital signs monitors, medication safety cabinets, a wireless telemetry system and wireless nurse-to-patient communications devices called Voceras, to name a few.